For Unity-specific instructions, please visit https://github.com/tenjin/tenjin-unity-sdk. Note: We recommend using the latest version of Android Studio when integrating our SDK. Download the latest Android SDK from here. 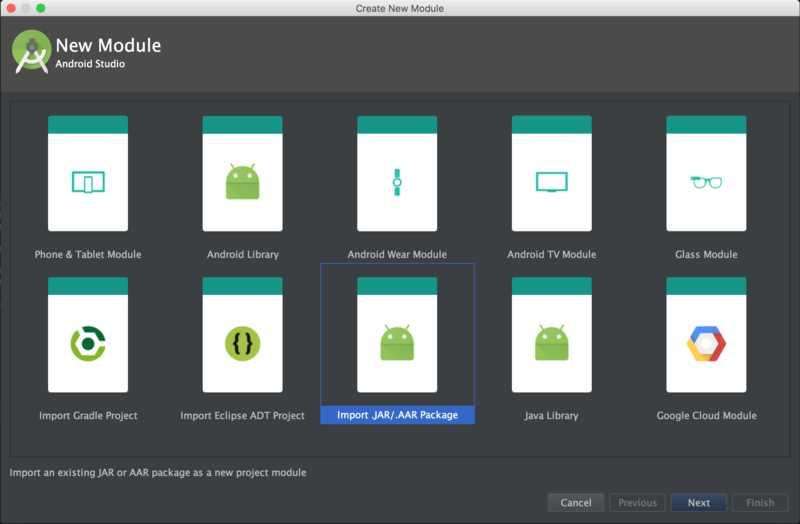 Add the tenjin.jar into your Android Studio project by selecting New > Module. In the New Module dialog, select the Import .JAR or .AAR Package option and click on Next. Select the tenjin.jar or tenjin.aar file click on Finish. If you haven’t already installed the Google Play Services, add it to our build.gradle file. Starting with Tenjin Android SDK v1.8.3, you will need to add Google&apos;s Install Referrer Library. Create a folder libs in your project&apos;s root folder. Copy the tenjin.jar file to the libs folder. Install Google&apos;s Android Support Repository, Android Support Library, Google Play Services and Google Repository SDKs from the SDK Manager. Google outlines how to best configure this if you haven&apos;t already. Get your API_KEY from your Tenjin Organization tab. 3b. Alternate initialization to handle deep links from other services. (DO NOT USE 3a and 3b. You need to use only one.) If you use other services to produce deferred deep links, you can pass Tenjin those deep links to handle the attribution logic with your Tenjin enabled deep links. To understand user revenue and purchase behavior, developers can send transaction events to Tenjin. There are two ways to send transaction events to Tenjin. Validate receipts Tenjin can validate transaction receipts for you. IMPORTANT: You will need to add your app&apos;s public key in the Tenjin dashboard > Your Android App > Edit. You can retreive your Base64-encoded RSA public key from the Google Play Developer Console > Select your app > Development Tools > Services & APIs. Tenjin will calculate the Total Revenue from a transaction based on quantity*unitPrice Tenjin will record and track the revenue based on the currency code, quantity, and the unit price sent. You can use the Tenjin SDK to pass a custom event: eventWithName(String name). NOTE: DO NOT SEND CUSTOM EVENTS BEFORE THE INITIALIZATION connect() event (above). The initialization event must come before any custom events are sent. You can use the Tenjin SDK to pass a custom event with an integer value: eventWithNameAndValue(String name, String value) or eventWithNameAndValue(String name, int value). Passing an integer value with an event&apos;s name allows marketers to sum up and track averages of the values passed for that metric in the Tenjin dashboard. If you plan to use DataVault, these values can be used to derive additional metrics that can be useful. Using the example above, the Tenjin dashboard will sum and average the values for all events with the name item. Keep in mind that this event will not work if the value passed not an integer. Tenjin supports the ability to direct users to a specific part of your app after a new attributed install via Tenjin&apos;s campaign tracking URLs. You can utilize the getDeeplink method and callback to access the deferred deeplink through the data object. To test you can follow the instructions found here.